A perfect getaway for a family that enjoys winter activities! 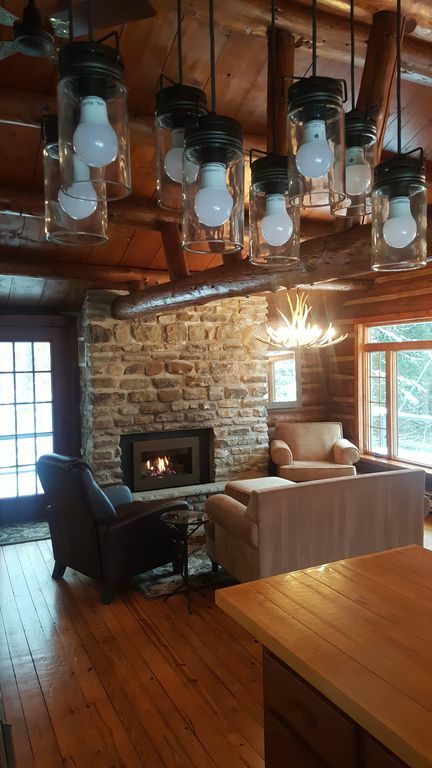 This charming log cabin was originally built in the Letchworth State Park area. In 1981 the cabin was disassembled and rebuilt, log by log, at its current location just seconds from downtown Ellicottville, NY. There is so much character in this 1,440-sf cabin. Made up of beautiful log beams, antler chandeliers and large picture windows throughout. Sleeps 6 with 3 bedrooms and 2 full bathrooms. Two bedrooms have queen beds and one room has twin sized bunk beds. This perfectly appointed home has everything you may need including bed linens, towels, fully stocked kitchen, Keurig coffee maker, washer/dryer, satellite TV and internet. The gas fireplaces in the living areas give a warm and cozy feel. The front deck has views of Sunset slope at Holimont and a spring fed pond that supplies water and never freezes. Just bring your skis and some hot chocolate! Ellicottville, NY is a quaint town just a half a mile from the log cabin. A small strip of everything you could need for the weekend. Be sure to take a walk through and visit Ellicottville Brewing Co., Balloons, Watson's Chocolates, the Ski Tree as well as a dozen other small restaurants, bars and shops. We are located less than an hour drive from downtown Buffalo, NY, a little over 3 hr. drive from Toronto, CA and approximately 2 hours from Rochester, NY. toilet, combination tub/shower, tub, Lower level. toilet, combination tub/shower, Upper level. Dining table has leaf extensions. Two Dish connected TV's . One on the lower level and one on the second level. Also two TV's for WiFi connections. We recently stayed here for a family ski weekend at Holimont. The cabin was spacious, comfortable and well appointed within minutes of either Holimont or Holiday Valley. Frank and Stephanie were extremely responsive to our questions and requests. We look forward to going back! Great cabin, perfect for a quick getaway! This was the perfect cabin for a long ski weekend. The first floor was great for storing gear and made for a wonderful play area for our 10 month old. The main floor is just plain gorgeous with the hard woods and the large window. The cabin was clean, comfortable, and had everything we could have asked for as guests. It took a little bit to figure out the light switch locations and how to regulate the heat using the fireplaces, but once we did we were super cozy. The only negative was that while the driveway was cleared of snow, we had to shovel our way into the house. No problem at all for us but it could be a problem depending on the age and fitness level of the guest. Overall we LOVE this cabin and would gladly book it again. Great location, very quaint aesthetic married with modern updates. Wonderful place to stay. We had a wonderful time at the house. It was only a two minute drive from Holimont and less than five minutes from downtown Ellicotville. The cabin is modern but quaint and has all of the appliances, fixtures and furniture that you would want. Plenty of kitchen necessities were provided. It was a great value and we only wish we could have stayed longer. Property is well maintained and has a lot of charm. Well laid out for our trip with two family with babies. Cozy cabin with everything we needed from our stay. Serene setting.